Founded in 2008, the Shepherd Society is comprised of called workers who have been recognized for making a difference in people’s lives through their ministries. 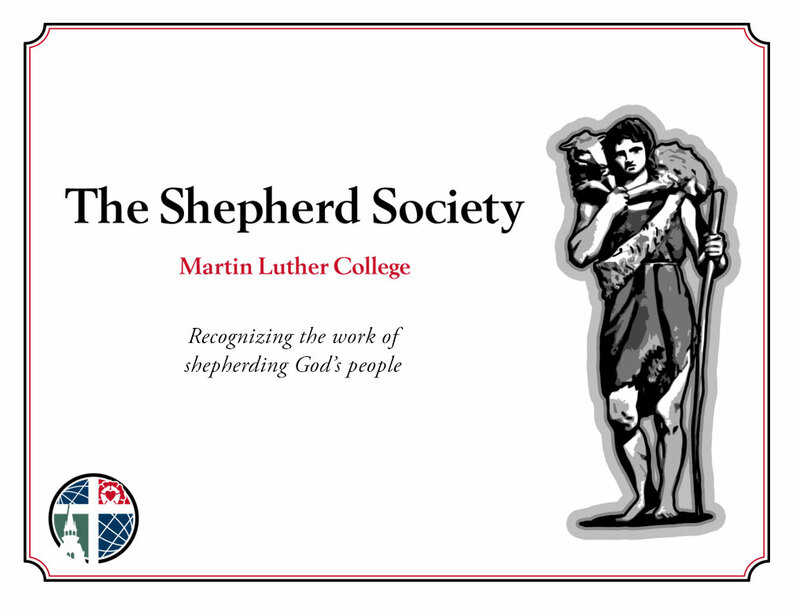 Anyone may nominate a pastor, teacher, or staff minister for the Shepherd Society by filling out a form (see right) and sending it to Martin Luther College along with a gift of gratitude. In so doing, the donors support the training of future called workers at MLC. At the same time, they express their gratitude to our Lord Jesus Christ, the Good Shepherd, and to the specific called worker who has shepherded them in a special way. The called workers nominated for the Shepherd Society receive a commemorative plaque with a personal Certificate of Appreciation. If you would like to thank a pastor, teacher, or staff minister who has made a difference in your life, please download the form and send us the form with your gift. It’s a great way to help MLC, thank a special person, and glorify our Lord, the Good Shepherd!